Inspired by the strong tradition of natural healing in Bali, The Spa at the Breezes provides a soothing oasis to relax, unwind and rejuvenate. Stepping stones lead over a pond filled with lilly pads to an entrance flanked by a beautiful statue of Ganesh – the benevolent Hindu god, draped in marigolds and offerings of frangipani and fresh coconut. The spa’s contemporary setting of soft green furnishings, trickling water fountains and black stone floors creates a tranquil environment; as do private treatment rooms with evocative names like Purity, Harmony and Bliss. As I sip warm, spicy ginger tea a therapist brings a wooden tray bearing the natural goodies that will be part of my four hour Royal Touch Pampering treatment. 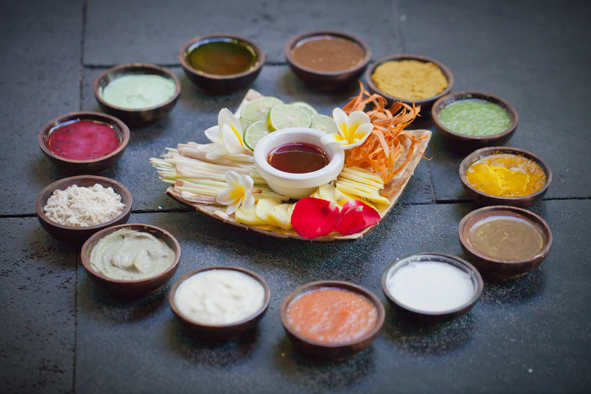 There are glass bottles filled with aromatic massage oil, a creamy coconut scrub, freshly ground coffee, thick sticky honey, ground candlenut, and dozens of slices of cucumber. 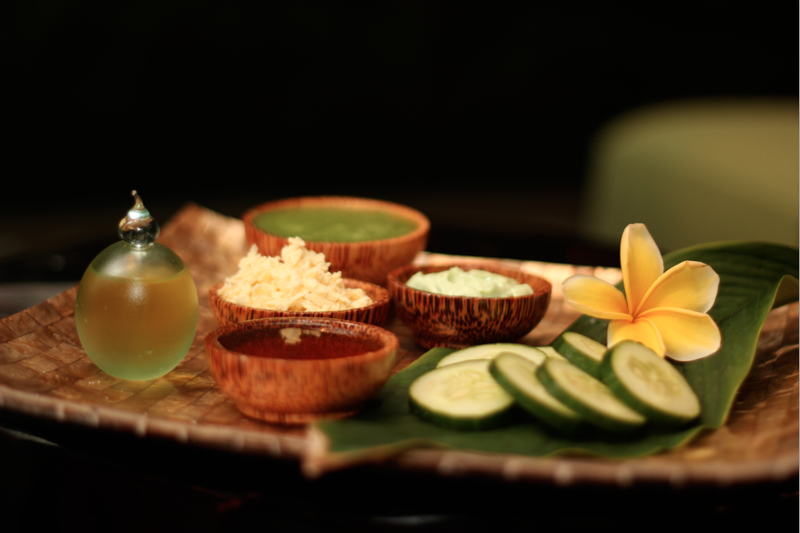 It looks more like a healthy feast than a spa treatment – I guess this is what you call a feast for the senses. Robed in a kimono I start with an invigorating foot bath with volcanic salt scrub, followed by a deeply relaxing massage imbued with the intoxicating aroma of lemongrass and ginger. Lulled into a state of utter serenity I am scrubbed from top to toe with creamy coconut, then smothered in a thick wrap of coffee blended with honey. The aroma of coffee is wonderfully stimulating and the sensation on my body is wonderfully smooth and deeply nurturing. Coffee is a well known antioxidant and helps reduce cellulite while honey is deeply moisturising and also acts as an anti bacterial. Next, a soak in the bath tub filled with flowers. I am so relaxed I can barely walk and my therapist helps me back on the massage bed where my face is gently scrubbed with ground candlenut, then massaged with honey followed by a cool application of cucumber as a soothing mask which leaves my skin deeply hydrated and refreshed. My treatment finishes in the peaceful spa lounge with a deluxe OPI manicure and pedicure with my hands, feet and nails buffed and polished and lacquered.